Pendulum Effect: If another "Dinomist" card(s) you control would be destroyed by battle or an opponent's card effect, you can destroy this card instead. Monster Effect: You can Tribute 1 other "Dinomi.. Cannot be used as an Xyz Material for an Xyz Summon, except for the Xyz Summon of an Insect-Type monster. Once per turn, if this card is in Attack Position: You can target 1 Level 3 Insect-Type monste.. Cannot be used as an Xyz Material for an Xyz Summon, except for the Xyz Summon of an Insect-Type monster. 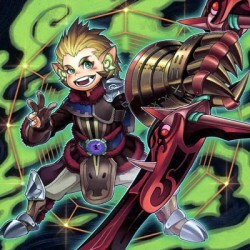 Once per turn: You can target 1 face-up Attack Position monster you control; change it to Defe..
During either player's turn, if your opponent controls more monsters than you do: You can discard this card; reveal 1 card in your Extra Deck, then look at your opponent's Extra Deck, also banish all ..
Once per turn, during your Main Phase 1: You can make this card gain ATK equal to the combined ATK of all "Deskbot" monsters you currently control, except "Deskbot 009", until the end of your opponent..
1 Tuner + 1 or more non-Tuner monsters. At the start of the Damage Step, if this card battles a Special Summoned monster: You can make this card's ATK become double its current ATK until the end of th..
2 or more Level 3 LIGHT Insect-Type monsters. Once per turn, during either player's turn: You can detach 2 Xyz Materials from this card, then target 1 monster your opponent controls; change its battle..
2 or more Level 5 LIGHT Insect-Type monsters. You can also Xyz Summon this card by detaching 2 Xyz Materials from a Rank 3 or 4 Insect-Type Xyz Monster you control, then using that Xyz Monster as the ..